This is one tasty beverage. Just 35 calories a bottle with 7 grams of sugars and a Glycemic Index of 19. The flavor is heavy pomegranate, which is surprising since it only contains 1% pomegranate juice (and overall just 5% of the beverage is made from juice). 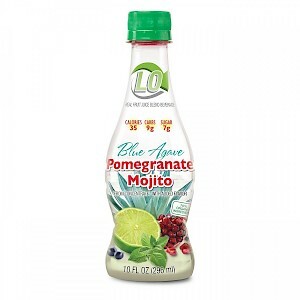 At work here is the added natural flavor along with Elderberry, Blackcurrant and Grape seed extract - along with both Blue Agave, which is surprisingly organic and stevia. And what's with the picture of the lime? No lime in the ingredients.